Canada Carbon Inc. (TSXV:CCB) is a graphite-focused exploration company with three wholly-owned properties in Quebec. The company is currently focused on the Miller project which holds a rare form of hydrothermal lump-vein (HLV) graphite. Planned production from Phase 1 development of the Miller project, as outlined in the 2016 preliminary economic assessment (PEA), consists of nuclear purity graphite and architectural marble. Canada Carbon has shown it can produce a high purity graphite concentrate from flotation recovery without the need for expensive chemical processes. The company has also demonstrated that through thermal processing the Miller HLV graphite can obtain a purity of 99.9998 percent graphitic carbon, making it suitable for high-technology applications, including nuclear as well as aerospace and military end-uses. 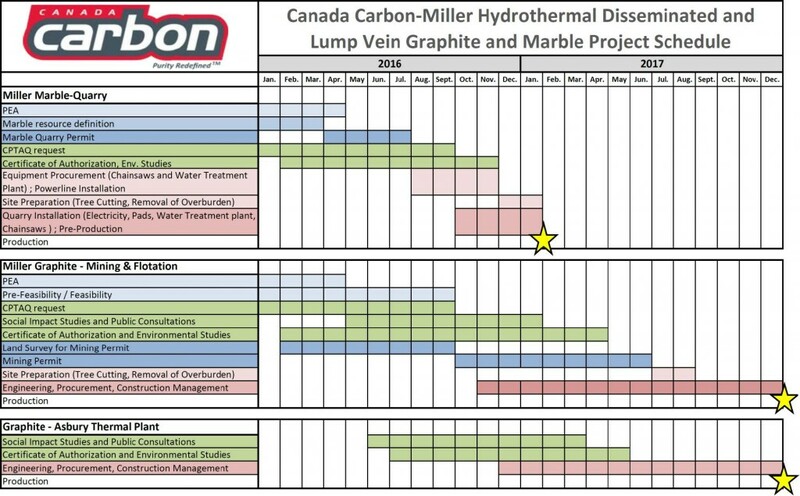 Canada Carbon’s ultra-high-purity Miller HLV graphite is currently undergoing testing by several international labs for assessment in their research programs. The company is also awaiting designation as an ASTM International standard for nuclear graphite. Canada Carbon has secured a 10-year, 200-tonne supply agreement with Dunedin Energy Systems Ltd., a Canadian developer of small modular nuclear reactors, for US$40,000 per tonne. Dunedin Energy also has the option to purchase an additional 50 tonnes at any time at a price of $45,000 per tonne. Permitting and a pre-feasibility study are currently underway at the Miller project. Canada Carbon is taking a rolling resource approach to managing the Miller operations, allowing for an earlier start to production and cash flow to fund future exploration. The company plans to continue focusing on exploration at its Miller property with exploration on the Asbury and Dun Raven properties to follow. Canada Carbon welcomed the addition of Dr. Pieter Barnard to the company’s Board of Directors. Barnard has spent his entire career in management positions at GrafTech International. 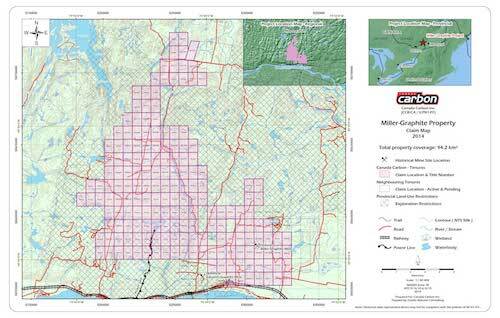 The Miller graphite project is located 80 kilometers west of Montreal in the township of Grenville, and comprises approximately 100 square kilometers which includes the historical Miller mine and surrounding area. Phase 1 development at Miller occupies approximately 0.22 square kilometers. The Miller project contains a rare hydrothermal lump-vein graphite deposit. The Miller graphite mine was likely the first graphite mine in Canada. The project features extensive infrastructure, including a highway that crosses through the property, a paved access road to the mine entrance, available electrical power and a nearby rail line, making the property amenable to low-cost development. Furthermore, a river passes through the property and is accessible 250 meters north of the worked area. The towns of Grenville, Quebec and Hawkesbury, Ontario, located a few kilometers to the south, will provide ready sources of skilled labor and services. Graphite is an ideal material for the construction of nuclear power reactors, as well as many defense and aerospace applications, because it retains its physical properties, including strength, at significantly high temperatures. To be nuclear-grade, the graphite product must be of exceptionally high purity. In 2015, ASTM International revised its standard for nuclear grade graphite to a purity threshold of 99.995 percent graphitic carbon as well as less than 2 ppm equivalent boron concentration (EBC). It’s critically important that nuclear graphite be free of neutron-absorbing material, in particular boron. Very few upgraded graphite products can pass this stringent EBC requirement. In early 2015, Canada Carbon reported it had achieved 99.9998 percent graphite concentrate purity using commercially available nuclear graphite thermal upgrading, with a calculated EBC of only 0.72 ppm. 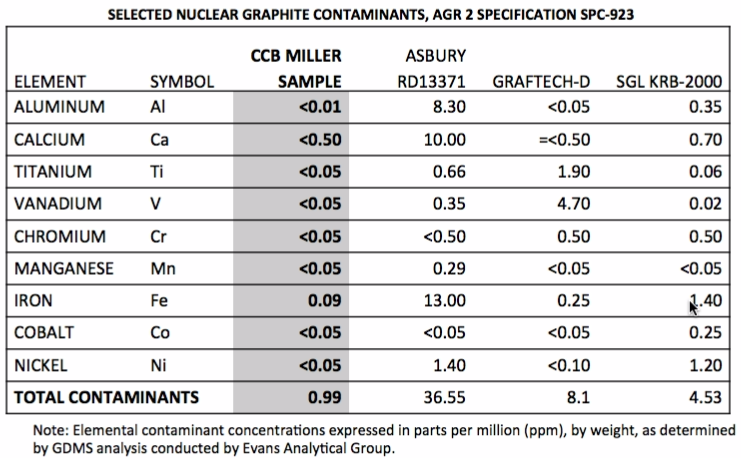 In May 2015, the company announced that Evans Analytical Group certified the Miller graphite is of sufficient purity for nuclear applications. Canada Carbon believes that the future demand from the nuclear industry will be more than sufficient to consume the company’s total annual production. Nuclear-grade graphite is anticipated to sell for US$18,000 to $35,000 per tonne. In September 2016, Canada Carbon signed a non-binding MOU with Dunedin Energy, a Canadian developer of small modular nuclear reactors. Under the terms of the agreement, Canada Carbon will supply 200 tonnes of Miller graphite per annum for 10 years for US$40,000 per tonne. Additionally, Dunedin Energy has the option to purchase an additional 50 tonnes at any time at a price of $45,000 per tonne. The US Department of Energy’s Office of Nuclear Energy is funding research aimed at designing and developing high-temperature, graphite-moderated prismatic and pebble-bed nuclear reactors. ASTM International, a US based international standards organization, has requested samples of the thermally upgraded high-purity Miller graphite for the development of a new nuclear standard test method for natural graphite. Four international laboratories, all of which are members of ASTM International’s subcommittee on Manufactured Carbon and Graphite Products, have completed testing of the Miller graphite. Canada Carbon is awaiting the final ASTM report, which is expected to certify the Miller graphite material for use in nuclear applications. The 2016 PEA demonstrates that Phase 1 of the Miller project has robust economics and the potential to provide high-purity specialty graphite products for advanced technological applications. The PEA is based on two products: specialty, thermally-processed graphite product of greater than 99.99 percent graphitic carbon and marble blocks suitable for architectural applications. 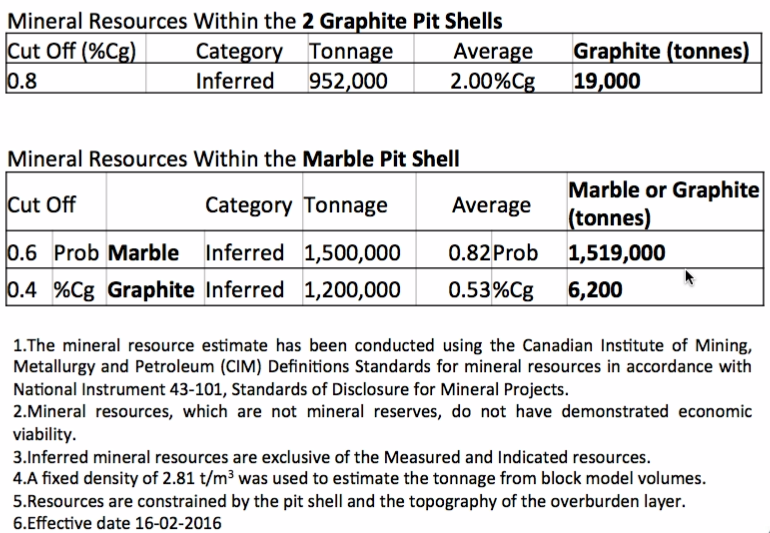 The PEA includes a mineral resource estimate for both the graphite and architectural marble resources. The marble mining operation is expected to last eight years, producing approximately 150,000 tonnes of architectural marble annually. The graphite mining operation is expected to last for 17 years, producing 1,500 tonnes of specialty high-purity graphite product annually. The proposed processing facilities are scalable and Canada Carbon believes there is potential for production growth at Miller. Phase 1 resource definition drilling was intentionally shallow, at an average vertical depth of less than 50 meters, in order to define near-surface resources sufficient to support development of the project. While Miller has higher processing costs per tonne compared with large producing mines, the high purity graphite commands higher prices which results in revenues exceeding cash mining and processing costs by an average of C$8,667 per tonne. In addition to being amenable to low-cost development due to the shallow mineralization of the deposit, the Miller project will likely garner low production costs due to relatively low levels of treatment required to produce high-purity graphite. Canada Carbon has received results from metallurgical testing at Miller, and has achieved exceptional flotation results for graphite from the deposit. Typically, graphite production requires flotation to produce a concentrate, which is then subjected to chemical or heat treatments to further increase the purity of the graphite. 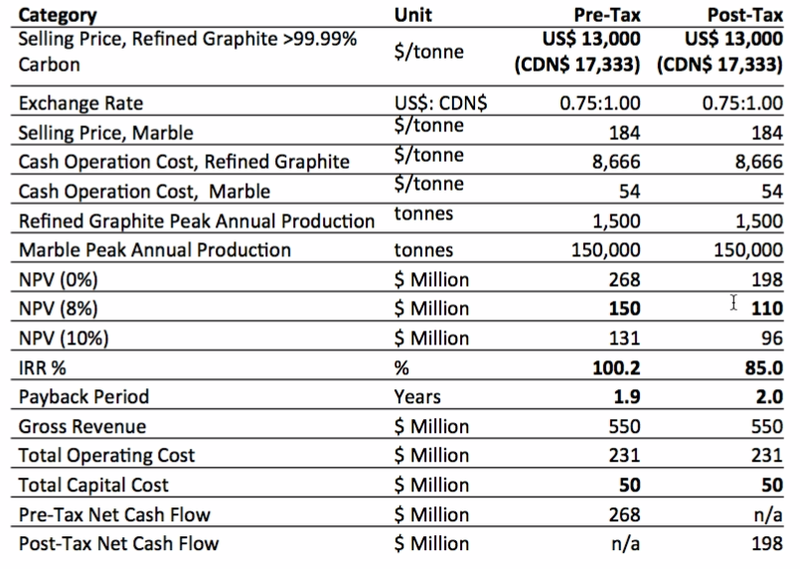 However, Canada Carbon has achieved exceptional graphite purities from flotation alone, meaning that the HLV graphite from Miller may not require further costly processing steps. In Q1 2016, Canada Carbon commenced pre-feasibility study-level work at Miller. An in-fill drill program totaling 47 holes over 3,405.5 meters has already been completed. The results will be used to upgrade the inferred graphite and marble resources to earn recognition as a measured and indicated resource. The data from the marble zone is expected to allow the company to apply for a quarry lease. Environmental assessments for the entire Miller property as well as the Asbury property are well-advanced and expected for completion before the end of summer 2016. Following a positive pre-feasibility study, marble production is anticipated to begin in February 2017, followed by graphite production in January 2018. Canada Carbon signed an annual $13.75 million sales contract for 75,000 tonnes of architectural-quality marble from the Miller graphite project in November 2015. An independent market assessment has led to an agreed base valuation for marble blocks or slabs of $14 per cubic foot, which is approximately $184 per tonne. Additional provisions have been set for price increases above this base case, as well as royalties to be paid on the sale of all value-added marble products. The agreement will run for one year starting from the date of the acquisition of the required environmental approvals and an extraction permit to quarry the material, and is renewable. Canada Carbon will apply for a quarry permit as soon as viable. Miller Phase 1 production entails extraction of graphite and marble from three open pits—two pits for graphite and one pit for both graphite and marble. The flotation plant will be located onsite at Miller. The concentrates will be shipped for thermal upgrading at the thermal treatment plant to be located at the Asbury site, 150 kilometers northwest of Miller. Canada Carbon plans to continue exploration work on the Miller property to further define resources. The current project scope only covers 0.22 square kilometers of the entire underexplored 100-square-kilometer Miller claims package. Drill results indicate the deposit is open at depth and on both strike extensions, and there are several known geophysical anomalies still to be explored. A large geophysical anomaly identified by aerial EM surveys lies beneath the proposed graphite pits, and will be drill sampled during the period of planned mine operations. Field exploration on the West Block, approximately 10 kilometers west of the Miller Phase 1 mine development activities, has been initiated. Two grab samples extracted from the bedrock sites are currently being processed and will be reported once results are available. Canada Carbon reported in June 2016 that it has partnered with Celtig LLC, and is in the final stages of qualifying its graphite as potential feedstock for the production of non-oxide graphene nano-platelets. Celtig LLC is a Tennessee-based producer of high quality graphene nano-sheets and flakes, and aims to distribute commercial quantities of this line of products at affordable prices to markets worldwide. Canada Carbon’s two other Quebec-based graphite properties offer further potential for new discoveries. The Asbury property, site of the thermal treatment plant, comprises 119 hectares and includes the past-producing Asbury graphite mine. The Dun Raven property features a historic resource of 571,532 tons grading 4.72 percent graphite, based on historic drilling over a geophysical anomaly that was only partially completed. Roughly 75 percent of the anomaly remains to be drilled. Bruce Duncan brings to Canada Carbon over thirty years of experience in the capital markets and brokerage industry. He is the Principal of West Oak Capital Partners, which provides strategic advisory services, including identifying and qualifying merger and acquisition candidates and advising in public transactions. Duncan currently sits on the boards of several private and public companies and is the CEO of Evolving Gold Corp., and CEO of Canada Coal. On September 20, 2018 Duncan was appointed to the Board of Directors of the Canada India Economic Council (CIEC). Olga Nikitovic is a chartered accountant and management consultant with 30 years of work experience. Nikitovic worked at PricewaterhouseCoopers for 9 years in both the audit and management consulting departments. After leaving PricewaterhouseCoopers she held senior management positions with two of Canada’s largest retailers. At present, Nikitovic is the Chief Financial Officer for a number of private and publicly traded mining companies. Dr. Pieter Barnard retired in November 2014 as President for the global Industrial Materials division of GrafTech International Holdings Inc. Dr. Barnard was a Reporting Officer for GrafTech International and served as chairman and board member for several of GrafTech’s international affiliates. He gained extensive international experience traveling to many countries across the globe and working in South Africa, Europe and the USA. Dr. Barnard was appointed President, Graphite Electrodes in April 2005 and President Industrial Materials in April 2008. In these roles, he led the division that manufactures a broad range of high quality graphite electrodes, petroleum needle coke and graphite/carbon refractory products. Dr. Barnard was appointed President, Graphite Electrodes in April 2005 and President Industrial Materials in April 2008. In these roles, he led the division that manufactures a broad range of high quality graphite electrodes, petroleum needle coke and graphite/carbon refractory products, increasing sales from US$600 million to over US$1 billion, and EBITDA from US$130 million to US$350 million. In addition to his role as President for Industrial Materials, Dr. Barnard also managed several corporate functions providing services to both divisions and the corporate group. These included Health Safety and Environmental Protection, Worldwide Engineering and Procurement. Bruce Coventry brings more than 35 years’ experience in the automobile industry to his position on the Board. He has held senior management positions with General Motors, Ford, Chrysler, Global Electric Motorcars and Dresser Inc. Coventry was previously CEO, Nostrum Motors as well as VP Operations, Electrovaya Inc. Electrovaya designs and manufactures Lithium Ion Super Polymer batteries, battery systems and battery-related products for clean electric transportation vehicles. From 2005 to 2009, he held a Board position with Global Engine Manufacturing Alliance, a JV between Chrysler, Hyundai and Mitsubishi. George Lipton is a registered Professional Geoscientist with the Association of Professional Geoscientists of Ontario (APGO). He has more than 33 years of field experience in international exploration for base metal, precious metal, diamond, and industrial mineral deposits, most of which was with BHP International and Utah International as a Senior Geologist. Lipton has been a frequent speaker at professional conferences and at seminars, and has authored and co-authored numerous technical papers. He was previously President, CEO and Director of Metallum Resources Inc.
*Disclaimer: The profile provides information which was sourced and approved by Canada Carbon in order to help investors learn more about the company. Canada Carbon is a client of the Investing News Network (INN). The company’s campaign fees pay for INN to create and update this profile page, to which links are placed on Investingnews.com and channel newsletters. By completing this form, you are giving consent to receive communication from Canada Carbon Inc. using the contact information you provide. And remember you can unsubscribe at any time.